Let's make National Scrapbooking Day a WEEKEND full of scrapbooking and celebrating. There will be games, prizes, laughter and lots of fun. Enjoy some great homemade meals. Take advantage of uninterrupted time to craft. Each person will get a goodie bag filled with STUFF, including a project kit for you to create with. Plus, there just may be a visit or two from the Scrap Fairy. Saturday, May 4 - 9am - 11pm Breakfast, lunch and dinner included. Seating preferences assigned on a first come, first served basis. Once you are registered, I will send out more information and request food allergies etc. too. 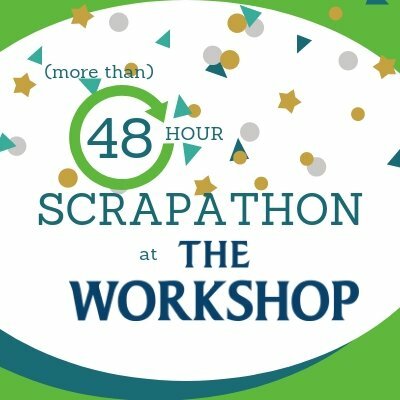 If you are not able to join us in person, but still want to experience the Scrapathon, we will once again be offering a “crop in a box” too, for $45 plus tax. Cancellation Policy: If written notice is given more than 48 hours (2 days) prior to the start of the weekend, then a full refund, minus $45 plus tax deposit will be returned to you. No refund will be given if written notice is received less than 48 hours (2 days) prior to event. In both cases, you will still be eligible to receive your Goodie Bag and project kit, available for pick up in store. Registration is transferrable to another person if you can find someone to take your place.